Add lots of color to your garden with Annual Plants! The best bedding plants for your garden. Planting annuals into containers and garden beds adds spice to your garden for the summer. Annuals grow and bloom in a single year and die off before or during the winter depending on your climate zone. These type of plants need to be replanted year after year. Perennial plants will return each and every year after going dormant over the winter which of course seems like much better value for money! In mild areas you can get some annuals to survive the winter and grow again for another year....but you shouldn't bank on this. They are usually not as prolific as in their first year anyway. Some annuals like Geraniums can be overwintered in a frost free place. This might be a good idea if you have some hard to come by varieties but in general it is often not worth the hassle. Why Should You Grow Annual Plants? You might think why bother with such short lived plants? Having to replant them every year of course costs time and money but these plants have the ability to flower for months on end. 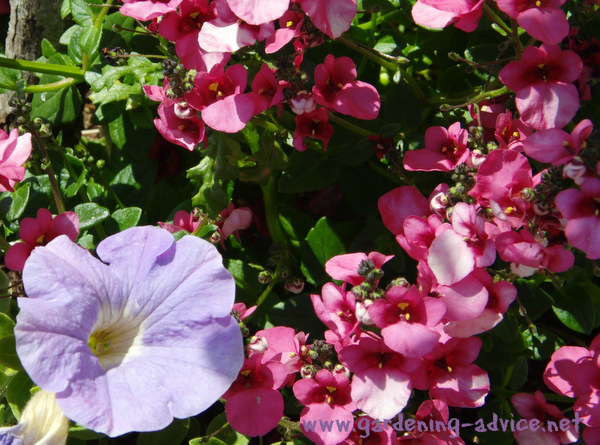 There are very few perennials that are able to flower from May to September like a Geranium or a Petunia will do. So if you want a beautiful container at your front door and you expect colorful flowers all summer long you need annual bedding plants to do the job for you. 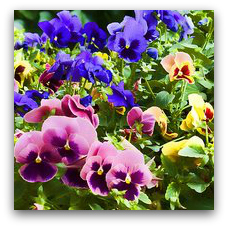 If you are looking for that extra splash of color in your flower beds why not try some annuals like Pansies, Primroses or Bizzy Lizzies between your perennial plants. 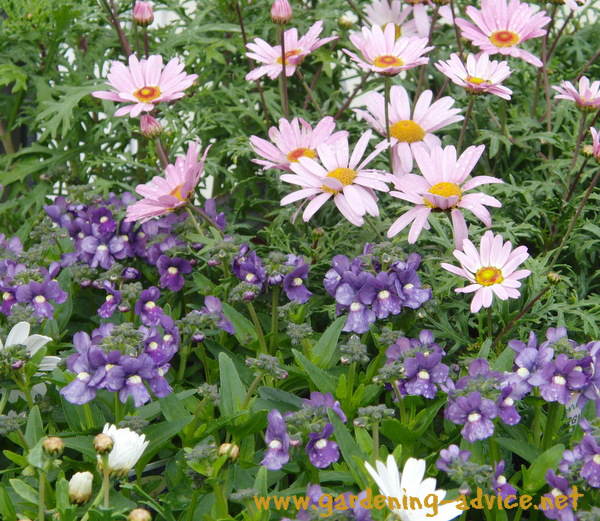 Check out this page for some tips on how to grow flowers successfully. Most of our summer flowering bedding plants originate from warmer climates where they would often grow for several years. That is why these plants don't tolerate frost and cold weather and simply die off once the weather gets cold in the autumn. They of course have been bred to have bigger more colorful flowers over a long period of time. You can buy annual bedding plants as small starter plants or you can try to grow them from seed. This is best done in a glasshouse or conservatory in early spring because most of these plants like a bit of heat and don't tolerate cold frosty weather. 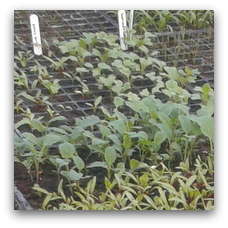 The seedlings will then need to be transplanted into larger pots after a while. Before planting out in late spring/early summer your tender annuals need to be hardened off so they don't get damaged by the weather. There is a bit of work involved in this...but it's fun! If you only need a few plants for some pots or hanging baskets I recommend that you buy them. This is a whole lot easier and you will have a great choice of different colorful varieties. Planting annuals bring lots of summer color to your garden. Learn how to grow some easy to grow flowers. 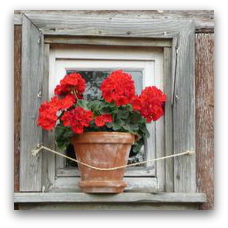 Gardening tips for growing Geraniums. This popular plant will flower all summer for you if you follow these tips! 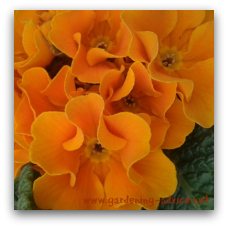 The colorful primrose plants brighten up your pots and flower beds in the spring. Don't miss out on this reliable spring flower! 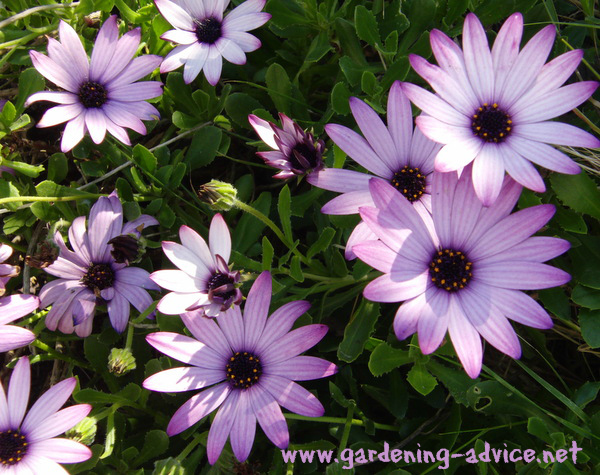 Grow this cheerful easy-grow flower in your beds and containers. A great plant for all seasons!